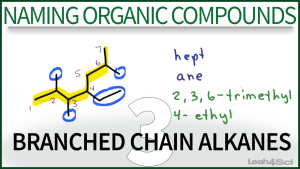 This tutorial video takes you through the steps of naming branched chain alkanes using the IUPAC naming rules. A branched chain alkane is an organic molecule that has smaller carbon chains sticking out in the middle rather than having all carbons connected in a single row. Video includes a number of practice problems from simple to tricky, single and multiple branches. This is Video 3 in the Naming Organic Compounds Video Series. Click HERE for the entire series. Need a review on Functional Groups? Watch the Functional Groups Video, Download the Cheat Sheet, then try the Quiz. Thank you for your videos! very helful! best tutor ever! you are very good at explaining!! Thank you Vincent. When are you testing? Have you downloaded my MCAT ebook? thank you so much so sharing the videos. they help a lot. Thank you, Which topics are you working on right now? Great work! These things are not easy to explain. Perfect explanation with visual view. Keep up the good work. Once more the information you give on the videos very helpful. You are very welcome. Which topics are you studying right now? i finding difficult to select the parent chain rarer than its very helpful.thank you for presenting these videos.and your voice too very nice. I just wanted to let you know that I did not even think about highlighting the parent chain!! We recently learned about this in Organic 1 class and your method and ideas are very helpful! Thank you !! I appreciate the help !! I really needed to refreshen my memory !!! Thank you very very, very much !!! Hi Leah! I really like your lessons.Your explanation is excellent and simply. I found your video lessons very helpful I would like to be subscribed to you. I really like your tutoring stragies. They are very helful.